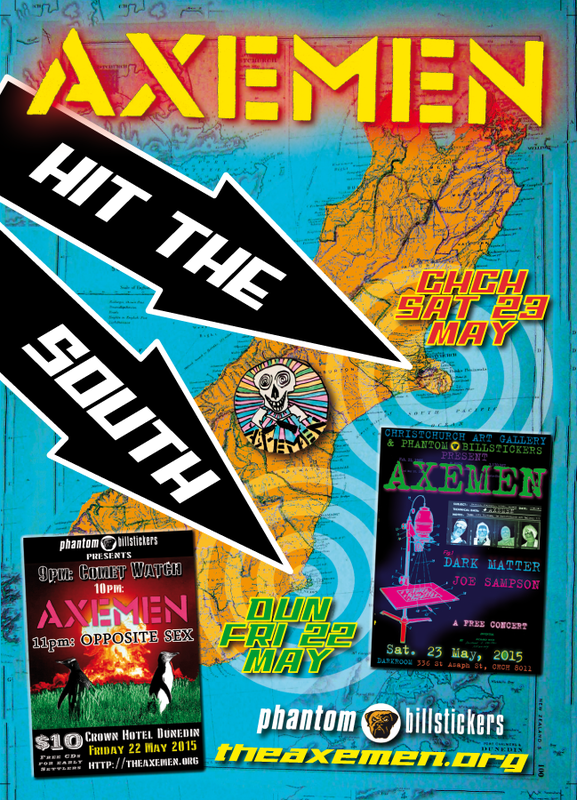 This May 2015 AXEMEN make an unseasonable sortie to the South Island of Aotearoa-wiki to bring you the HIT THE SOUTH! mini-est of Mini-Tours, a flying, flashing, heat-seeking TWO-STOP WHISTLE TEST visit to their spiritual homelands; the icy oasis of DUNEDIN on Friday 22 and the quaint rubble garden city of CHRISTCHURCH on Saturday 23! So what can Quakin’ Oat-Eaters expect of the lads this time around? You’ll be GLAD YOU ASKED! 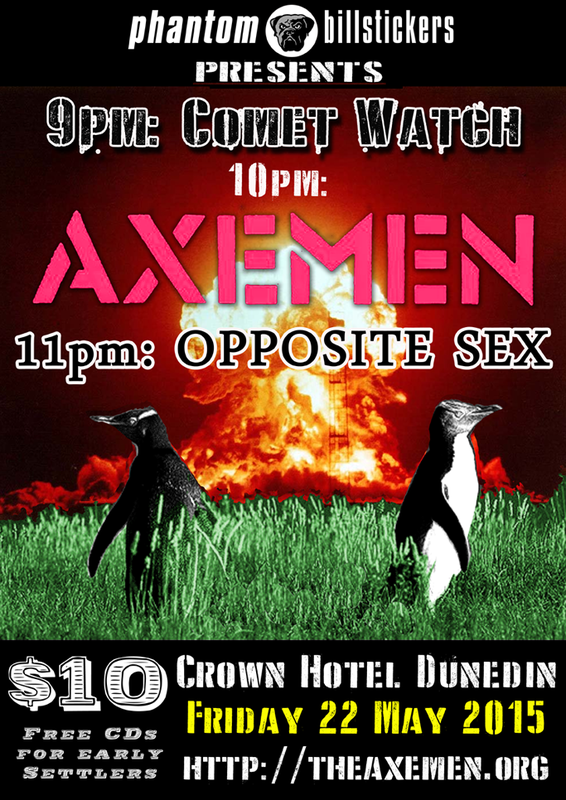 DUNEDIN – The evening of MAY 22 kicks off at the CROWN HOTEL with the cosmically hypnotic COMET WATCH at 9PM SHARP (RNR Standard Time) so don’t be late – they only come round once every 76 years! 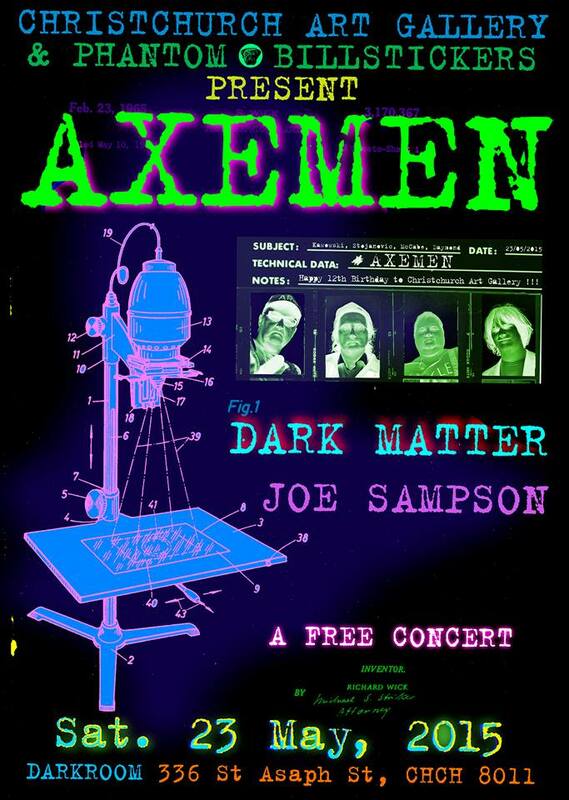 10PM brings The AXEMEN in their current formation of McCabe, Kawowski, Stojanovic and Daymond. The AXEMEN intend to play hits old and new, including tracks from their 2014 album ‘SAC TAP NUT JAM’, some old favourites, some as yet unrecorded tracks, maybe even a cover or two… so MEET THE GANG cos the BOYS ARE HERE! So what about CHRISTCHURCH? What have the lads most likely to got lined up for the city that rocks? Well you may ask! Thanks to the CHRISTCHURCH ART GALLERY the most Northerly Southern show at the DARKROOM is going to be absolutely FREE for Starters, that’s what! Add into the mix DARK MATTER with their rambunctious melodic stylings and the ever-eclectic JOE SAMPSON and we’re starting to have a show on our hands! And there’ll be plenty of RARE MERCHANDISE to lay your hands on so make sure you come early – its THAT RARE and VOLATILE it has a half-life of just THREE HOURS so get your skinny asses down there!